This post brings up a topic noted previously in the context of ‘subtle’ environmental toxic roots of disease processes. That prior discussion briefly raised the concept of an ongoing pathological process triggered by a transient exposure to a noxious environmental agent. In other words, in such a scenario, long after an initiating poison has done its handiwork, a disease process could continue to wreak havoc in a progressive manner. In the present post we look at the evidence for such ‘hit and run’ processes in a little more detail. In fact, if we cast a wide net for all instances of phenomena where a transient exposure to an agent results in long-term disease, much evidence can be amassed. This is exemplified by the induction of autoimmunity by toxic agents, which was discussed in another previous post. Two broad pathways for this kind of process were noted: either modification of self-antigens leading to damaging cross-reactive self-responses, or perturbation of normal immune cellular systems by toxic insult. In the first scenario, modification of a self structure by binding of a xenobiotic toxic agent results in the formation of ‘altered self’, which is capable (at least in the right genetic background) of triggering immune recognition. Unless suppressed by internal regulatory mechanisms, such recognition in turn will tend to result in clonal amplification of immune cellular subsets, and the formation of immune binding proteins (T cell receptors and immunoglobulins) which have been somatically tailored to ‘fit’ the offending immunogenic structure. If these recognition systems precisely reacted with solely the novel structures formed by interaction of a xenobiotic and a normal self-molecule, then perhaps it would always be self-limiting. (After a transient exposure to the toxic substance, the resulting ‘neoantigens’ would eventually be cleared from the host system, and receptors binding the neoantigens would be ‘out of a job’, but without causing any ‘collateral damage’ to the rest of the host). But evidence suggests that this is often not the case, since the newly-mounted immune responses can frequently target not only the original stimulating neoantigen, but also the original modified source structure, or even another related structure. If the novel somatic immune receptors formed in response to the neoantigen are then continuously maintained (or even further amplified) by the presence of the normal host structure, then a damaging autoimmune pathology may result. Of course, the same self-structure at the center of such autoimmunity does not normally provoke such responses in isolation, because individual immune systems are ‘educated’ during an individual’s development to assign it as ‘self’. Immune systems ‘learn’ tolerance towards self-structures through removal of potentially self-reactive clones or active suppression mechanisms. The process of side-stepping these normal control layers is often referred to as ‘breaking tolerance’, and from this point of view the original toxic agent can be seen as a tolerance-breaker, whose action circumvents normal controls and initiates an ongoing pathological effect. These points highlight the special features of normal life-saving adaptive immune systems which may be potentially subverted by a transient noxious exposure. But here the aim is to think about hit-and-run phenomena in more general terms, to include cases of apparent self-perpetuating inflammatory processes. In such cases, the immune system may be relevant at different levels, but is not necessarily identifiable as the chief instigator of the continuity of the process itself. A basic but fairly obvious factor to keep in mind was also raised within the Notes section of a previous post with respect to the marine bioproduct ciguatoxin. This addresses the very issue of ‘transience’ of an environmental exposure: to be literally so, the agent responsible must be removed from the host organism after a reasonably brief period of time. Since some compounds can persist in vivo for extended periods as a consequence of their fat-solubility, resistance to metabolic processing, or both, this is not a trivial question. Still, even the most intractable compounds are gradually eliminated after ingestion, while after-effects of such exposures are in some cases believed to persist for over a decade at least. Such is the case with the neurotoxin MPTP (noted previously in the context of Parkinson’s disease), where ongoing neuropathology has been attributed to toxic insults incurred many years previously. Note, though, that inorganic fibers (such as asbestos) are a major exception to the scenario of gradual elimination, since these can persist for decades and provoke ongoing inflammation. (See a previous post for a little more detail in this area). Poisons are non-replicators, but can damage or interference begun by a specific toxic agent become a ‘replicator’ of a different sort, by the establishment of a self-perpetuating process? For evidence of this, we must look to degenerative processes with the central nervous system (CNS), which may be uniquely susceptible to this kind of pathological problem. This observation stems from two major factors: the vulnerability of the CNS to permanent loss of terminally differentiated non-dividing neurons, and the special status of the CNS with respect to the immune system. It is true that the brain and nervous system is more capable of self-renewal (‘plastic’) than formerly believed, but this still exists within fairly rigid boundaries. For example, once neurons within the substantia nigral region of the brain are lost in sufficient numbers, Parkinson’s disease results (see a little more detail in a previous post), and neuronal regeneration does not occur. With respect to the immune system, the CNS has long been considered to be ‘privileged’, as a consequence of its effective compartmentalization through the selectivity of the blood-brain barrier in permitting access by peripheral physiological components. More recently, it has become increasingly apparent that ‘privilege’ in this context is more akin to specialization: while immune responses in the CNS may be relatively isolated, they are nonetheless vigorous and significant. Much of the cellular mass of the mammalian CNS is composed of non-neuronal cells termed glia. Just how much has been surprisingly controversial. A long-standing view held that glia outnumbered neurons in the human brain by tenfold or more, but relatively recent systematic studies suggest the glial / neuronal ratio it is more like 1 : 1, and thereby comparable with other primates. Glia themselves are compromised of a number of distinguishable cell types with various ascribed functions, broadly classifiable as macroglia (of which a number of subtypes are defined) and microglia. The latter in particular are functionaries of the innate immune system with a common lineage to peripheral monocytes and macrophages, and have been implicated in the mediation of inflammatory processes in the CNS. The word ‘inflammation’ literally means ‘the act of setting on fire’, or stirring up a metaphorical ant’s nest. Indeed, we can refer to a speech or written article as being ‘inflammatory’ as a consequence of its effect on listeners or readers. In a physiological context, the ‘fire’ connotation relates to the activation of potent cellular and molecular alarm processes which have evolved to counter threats to an organism’s normal functioning. (Of course, long before any understanding of cells and molecules existed, the redness, heat and swelling of an infected area of the body was itself suggestive of ‘flames’). So, inflammation per se is primarily beneficial, and it is an essential aspect of the multi-variate responses mammalian organisms make towards pathogens or damaged self. But inflammation can also result in pathology, and this is very significant with respect to self-perpetuating disease processes. All processes connected to the innate immune system require recognition of a triggering agent, which can either derive from a pathogen, or from the host itself as a consequence of tissue damage (‘pathogen /damage associated molecular patterns’; PAMPs and DAMPs respectively). This broad observation is thus applicable to the activation of inflammation. Microglia are activated by certain ‘danger’ signals occurring within the CNS, which is usually appropriate for management of a primary noxious stimulus. This only becomes a problem if the response cannot be turned off when no longer needed, suggesting a failure of regulatory mechanisms. Evidence for a pathological role of microglia in neurodegeneration has come through the use of the above-mentioned MPTP / Parkinson’s model. As noted in a previous post, considerable information exists regarding the direct toxic mechanism for neuronal killing in the substantia nigra after MPTP exposure, but this does not explain how short-term MPTP exposure could result in a sustained inflammatory pathology many years later, long after the initial offending chemical could no longer be present in any biologically significant quantity. Studies with long-term cell culture have reported that while MPTP has the expected initial direct toxicity on dopamine-producing neurons, only in co-culture of neurons and microglia is the effect progressive. Various studies are also suggestive of a role for microglia in human Alzheimer’s disease and other neurodegenerative conditions. For example, fragments of the amyloid-beta protein (which forms abnormal deposits in Alzheimer’s disease) can activate microglia towards a pro-inflammatory state. The first example of ‘hit and run’ circumstances was noted above in the context of autoimmune misdirection of the adaptive immune system, where cross-reaction with a self-antigen may set up an ongoing self-destructive process. It is then somewhat ironic that the immune system is implicated in another major class of self-perpetuating pathology, albeit at the different level of innate immune responses. But this assigning of blame to a misfiring of innate immunity in neurodegeneration still does not explain how the failure of regulation occurs. Pathological inflammation involving microglial perpetrators and neuronal targets has been seen as a self-damaging feed-back loop, a vicious circle of sorts. In this model. neuronal destruction abetted by microglia results in the release of various self-structures which maintain microglial activation, leading to succeeding rounds of neuronal destruction and a continuously damaging process. The molecules which potentially mediate such microglial activation may be diverse, ranging from membrane breakdown products to bioproducts which are normally sequestered in the neuronal cytoplasm. Among such self-derived potential activators, one category of particular interest is misfolded or aggregated proteins. Aberrant protein folding or the formation of abnormal protein deposits is a hallmark of a range of distinct neurodegenerative conditions. In this regard, the prion diseases are a striking case in point. The nature of prion diseases was discussed in a post of the 5th April 2011 in the context of biological ‘dark matter’, where it was noted that prions represent remarkable instances of ‘transmissible conformations’. A prion is an alternatively folded variant of a normal protein, which can induce the normal form to assume the prion-specific fold. The roles of prions in general biology are becoming increasingly recognized, and there are precedents (especially in yeast) where prions appear to be biologically and evolutionarily useful. But within the human CNS, prions are very bad news indeed, as the causative agents of several uniformly fatal diseases. These include the sporadic condition of Creutzfeldt-Jakob disease, and the notorious transmission of ‘mad cow disease’ to humans through consumption of prion-contaminated meat. While it is generally (albeit not quite universally) accepted that prion proteins mediate disease through a conformational replication mechanism, this in itself does not explain how the observed pathogenic effects occur. Different prion diseases can have different gross pathological effects. Creutzfeldt-Jakob and ‘mad cow’ diseases are both classed as ‘spongiform’ encephalopathies owing to the sponge-like rendering of diseased neural tissue, but the two are nonetheless histopathologically distinguishable. In certain other prion diseases, the spongiform effect is absent or much reduced, but not the fatal neurological outcome. There is evidence that pathogenic prion accumulation can directly destroy neurons through the induction of specific cell death (apoptosis), but inflammatory processes and aggregation of microglia may also play a role. The full picture of how such protein-mediated diseases progress is undoubtedly complex and far from fully defined. Nevertheless, the link between prion diseases and other neurodegenerative conditions through suspected inflammatory processes may be reflected at a more fundamental level. Evidence has accumulated to the effect that prion-like effects may be a factor in neurological diseases which are far more common than the relatively rare known prion encephalopathies. Phenomena suggestive of prion mechanisms have thus been reported for Alzheimer’s disease (with respect to the amyloid beta protein) and Parkinson’s disease (in the context of the protein a-synuclein). Indeed, a central role for prions has recently been posed as a unifying hypothesis for all neurological disease, although it remains unproven at this point, at least where prions are defined as fully infectious proteinaceous agents in isolation. If essentially correct, though, this view would provide a mechanism whereby an inflammatory process is maintained continuously. Ongoing prion-based replication and spreading could provide a steady source of ‘damage’ signals that may serve to activate microglia, and thus promote inflammation and a self-perpetuating cycle of host cell destruction. (Cell death then could result from a combination of both direct prion effects and continuously induced deleterious host responses). The prion link has a certain logical appeal when attempting to explain a truly self-propagating disease process. If an inflammatory response continues indefinitely solely in response to release of ‘danger’ signals from intracellular sites (which are normally shielded from immune cells), it is not obvious how any inflammation site can escape falling into the same trap. Or at least, one might expect that self-perpetuating inflammation would be even more of a problem than it is. One potential answer to this (as noted above) proposes that self-propagation of inflammation results from a failure in homeostatic immune regulatory mechanisms, which might itself be induced by toxic environmental exposures. Yet this is still less than satisfying as an explanation for how a short-term environmental exposure could result in an indefinitely persisting pathology. After removal of a toxic agent, why should cellular regulatory networks not regain their function and exert normal controls once more? For example, after strong suppression of HIV from patients with high-activity antiretroviral drugs, the CD4+ helper T cell targets of the virus rebound and immune functioning is restored. This is not to say that other mechanisms for long-term regulatory perturbations from transient exposures are impossible, but invoking a potential role for prions seems consistent with many current observations. While misfolded proteins were noted above as but one of many potential classes of ‘noxious self molecules’, the subgroup of ‘noxious self’ known as prions have the unique ability to propagate their undesirable misfolded conformation in a manner other structures cannot. Now we come to a central part of this post, where previous thoughts about ‘subtle’ environmental toxic agents can be linked with the concept of self-propagating hit and run processes. The underlying premise is that prions cause certain fatal neurological diseases (no longer controversial) and possibly contribute to all neurodegenerative conditions (still an unresolved matter). From this stance, we can question how prion misfolds are generated in the first place, and how this can be affected by environmental influences. Firstly, it should be noted that known prion diseases can have a clear-cut genetic basis, owing to the increased propensity of certain mutant forms of the cellular prion protein to adopt different versions of self-transmissible pathological prion forms. But these are very rare, and most human prion disease is classed as ‘sporadic’, or occurring without definitive known causes. The latter conditions themselves are (fortunately!) not at all common, only appearing at a rate of about 3 per million population. Then we should note that ‘sporadic’ cases are often distinguished from those which are acquired in known ways from an external source. While this is a somewhat arbitrary split, it does provide a useful divide between cases where a pathogenic prion may emerge spontaneously from some endogenous cause, and those where the prion replication cycle is initiated by some external agent. While the focus within this post will thus be on the ‘acquired’ set of prion diseases, it will be useful also to spend a little time thinking about how prion conversion to the pathogenic form may ‘spontaneously’ appear. An important initial matter to note is that the incidence and form of sporadic prion disease is strongly influenced by a specific polymorphism within the normal cellular prion protein gene. In this case, a single nucleotide difference determines whether codon 129 specifies a methionine (M) or a valine (V). Sporadic Creutzfeldt-Jakob disease is manifested in distinct subtypes, which are associated with particular codon 129 genotypes (M/M or V/V homozygotes, or M/V heterozygotes; present at 52%, 12%, and 36% of Caucasian populations respectively). By the nature of the prion conversion process, a variety of ways can be proposed by which the pathogenic conformational switching could be sporadically triggered. In all such cases, it must be kept in mind that only a short-lived presence of a triggering event, whether associated with a variant-sequence prion form or not, would in principle be required. This could occur in a single replicating CNS cell through a somatic mutation in the normal prion gene, which predisposed the corresponding expressed protein towards the aberrant prion conformation. It could also take place through errors at the transcriptional or translational level, or even through translational pausing (a temporary slow-down of translation rate into protein from an mRNA template), which could affect the folding of the resulting protein product. Any of these effects would likely produce only a very small amount of altered prion protein, but a small quantity might be enough to set the deadly cascade in motion. Once progression is enabled, conformational conversion could proceed with altered normal protein, superseding any requirement for further input from the original triggering prion forms. But yet another interesting possibility comes at the level of protein chaperones which assist the folding of normal cellular prion proteins. If such assistance temporarily ‘goes bad’ for whatever reason, then it is easy to envisage that a pathogenic prion fold might emerge, which could then begin propagating itself by hijacking normally-folded forms into the same disease-causing structure. This theoretical possibility suggests that the stakes are considerably higher for prion folding than any other proteins. While an ordinary protein that eludes chaperone help and becomes misfolded will be simply degraded and recycled, a misfolded prion might have potentially lethal consequences for the entire organism. Some workers have considered the possibility that prion misfolds per se may be quite frequent, but usually kept under control by immediate chaperone binding and re-folding. But regardless of whether or not de novo prion misfolding is very rare or commonplace, chaperones can be seen in this case as a primary surveillance mechanism, safeguarding against the formation of an ‘enemy within’. In this respect, it is hard to avoid making an analogy between this molecular ‘chaperone surveillance’ and immune surveillance mediated by the adaptive immune system towards the formation of cancer cells. In both cases, a surveillance mechanism serves to forestall the development of potentially ‘killer replicators’. Although at very different levels and in very different ways, both cancer cells and prions blindly replicate themselves at the expense of their hosts, often with fatal results when the natural surveillance mechanisms break down or are overcome. In any case, the putative role of prion chaperones then leads into the area of ‘acquired’ prion disease, since the possibility has been raised (though apparently little investigated) that xenobiotics might at least in some circumstances have a role in subverting prion chaperone assistance, and thereby indirectly promote prion disease. What else can be said about ‘toxic’ acquisition of the pathogenic prion phenotype? Toxic Induction of Pathogenic Prions? Firstly, it is necessary to note that ‘acquired’ prion disease almost always refers to a pathogenic origin through the ingestion of infectious prions present within environmental sources. This has usually been associated with eating prion-contaminated materials, ranging from human brain during cannibalistic rituals of certain New Guinea tribes (with the acquisition of the neurodegenerative ‘Kuru’ form of Creutzfeldt-Jakob disease), to eating meat contaminated with bovine prions (leading to the above-mentioned ‘mad cow’ disease, or ‘new variant’ Creutzfeldt-Jakob disease). Yet it has also occurred through contamination of medical treatments, such as corneal grafts or naturally-derived human growth hormone prior to the availability of recombinant sources free of possible prion contamination. If we defined a ‘toxin’ or ‘poisonous agent’ very loosely, then the above cases would be classifiable as environmental toxic prion-triggering agents, but this of course is not quite what is mind. Can a non-protein compound produce the same effects? Here we must keep in mind that this could also have implications for general neurodegenerative diseases with ‘prion-like’ aspects, as well as for fully certified prion pathologies. As noted above, a xenobiotic might promote pathogenic prion misfolding via chaperone interference, but in principle this xenobiotic action could also underlie any mutational, transcriptional, or translational mechanism (as also mentioned above). Any such indirect action would be highly unlikely to have any specificity towards the prion gene or protein, but could in principle allow transient production of the undesirable prion protein conformation. Such theoretical events then are highly stochastic (chance-based) in nature, resulting as a product of the chance of (say) a mutagen affecting a potentially vulnerable CNS site multiplied by the chance of it then producing a somatic mutation in the prion gene, in turn multiplied by the chance of the mutant gene being expressed as misfolded prion protein, which then goes on to enforce its conformational and deleterious replication. Similar statements can, of course, be made regarding the chances of acquiring somatic mutations which lead to cancer. (See a previous post regarding the dual aspects of tumorigenesis vs. neurodegeneration). The end result means that mutagen-induced prion pathology must be exceedingly rare, but may occur within a large enough population of ageing individuals. (The longer an individual lifetime, the greater the chances that such untoward events may happen). But can a non-proteinaceous xenobiotic directly target prion proteins for misfolding, just as an environmental pathogenic prion ‘seed’ directly acts on endogenous normally-folded cellular prion protein? The notion of ‘seeding’ in this context has been viewed as a kind of templating or nucleation process, where non-prion templates have been referred to as ‘heteronucleants’ or ‘molecular casting’. In an interesting study over a decade ago, it was reported that infectivity of a hamster-adapted pathogenic prion could survive such high temperatures (600˚ C) that at least a subcomponent of it may correspond to some form of inorganic templating agent. (All proteins would be destroyed under such conditions). Under some circumstances, DNA strands can induce the formation of amyloids (extended alternative fibrillar conformations of certain proteins, with similarities to pathogenic prion protein aggregates). In either case, it might be presumed that an extended template structure is required to effect the necessary conformational conversion, which in simplistic terms involves converting protein α-helical structures to extended β-sheets. This kind of requirement might suggest that no low-molecular weight compound of modest dimensions could directly elicit prion conformational conversion. But the full picture is not so simple. Legend to Figure. Depiction of different pathways leading towards conversion of the normal cellular prion protein fold into the transmissible pathogenic form. The normal folded structure of the human prion protein is shown at the top, alongside the amyloid (replicable) form of a yeast prion (HET-s). For both, α-helical regions of proteins are red, β-strands green, loops light blue. 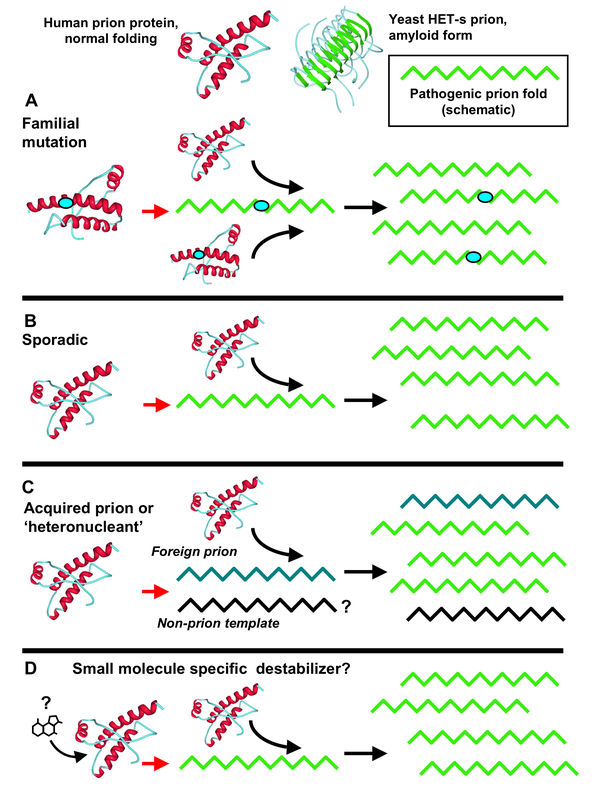 Prion conversion typically involves a shift in α-helical conformation into β-sheet, which is often associated with the formation of aggregates or fibrils. (Source of structures: Protein Data Bank; 1QLX normal human prion; 2RNM yeast HET-s. Images generated with Protein Workshop). A: Effects of a familial mutant prion protein. Here the mutation (light blue oval) acts in destabilizing the normal form, which then is pre-disposed towards adopting the transmissible conformation, capable of converting either mutant form or wild-type protein (relevant for wild-type / mutant heterozygotes). B: Sporadic conversion: Here a variety of endogenous rare events (as noted above) can potentially convcrt a small amount of prion, which can then act to ‘seed’ ongoing production of the pathogenic form. C: Acquired conversion. Here foreign prions ingested from environmental sources (such as contaminated foods or medical procedures) can establish the transmissible cascade. The hypothetical potential of other (non-prion) templating molecules with an extended structure is also depicted. D: Hypothetical action of a specific small molecule in binding and destabilizing normal prion protein, and leading to the same transmissible chain of events. In this case, the hypothetical compound chemically recapitulates the same effects of a deleterious mutation as in (A). Needs a trigger, they tell me, but which? (In order of citation, giving some key references where appropriate, but not an exhaustive coverage of the literature). ‘…..the induction of autoimmunity by toxic agents…..’ See a previous post for examples and references. ‘….after-effects of such exposures are in some cases believed to persist for over a decade. Such is the case with the neurotoxin MPTP…..’ See Langston et al. 1999. ‘…..the brain and nervous system is more capable of self-renewal (‘plastic’) than formerly believed….’ This was popularized by Norman Doidge in the book The Brain That Changes Itself (2007, Viking Press). ‘….that [immune] ‘privilege’ in this context is more akin to specialization….’ See Gao & Hong 2008. ‘…..long-standing view held that glia outnumbered neurons in the human brain by tenfold or more, but relatively recent systematic studies suggest the glia / neuronal ration it is more like 1 : 1.‘ See Azevedo et al. 2009. ‘……the activation of inflammation…..’ See Strowig et al. 2012, especially with respect to the ‘inflammasome’, a protein complex associated with inflammatory responses. ‘…..MPTP exposure could result in a sustained inflammatory pathology many years later…..’ This also refers to the work of Langston et al. 1999. See also McGeer et al. 2003, for similar effects observed in monkeys. ‘……while MPTP has the expected initial direct toxicity on dopamine-producing neurons, only in co-culture of neurons and microglia was the effect progressive….’ See a review by Gao & Hong 2008. ‘……a role for microglia in human Alzheimer’s disease and other neurodegenerative conditions.‘ See Blasko et al. 2004; Lull & Block 2010. ‘…..fragments of the amyloid-beta protein (which forms deposits in Alzheimer’s disease) can activate microglia towards a pro-inflammatory state….’ See Blasko et al. 2004; Frank-Cannon et al. 2009; Lull & Block 2010. ‘……there are precedents (especially in yeast) where prions appear to be biologically and evolutionarily useful.‘ See recent work from the lab of Susan Lindquist regarding the biological utility of prions in wild yeasts: Halfmann et al. 2012. ‘…..evidence that pathogenic prion accumulation can directly destroy neurons through the induction of specific cell death (apoptosis), but inflammatory processes and aggregation of microglia may also play a role….’ See Cronier et al. 2004; Kovacs & Budka 2008. ‘ Behavior suggestive of prion mechanisms has thus been reported for Alzheimer’s disease (with respect to the amyloid beta protein) and Parkinson’s disease (in the context of the protein a-synuclein).’ For example, see Nussbaum et al. 2012 and Angot et al. 2012 respectively. ‘…..a central role for prions has recently been posed as a unifying hypothesis for neurological disease, although it remains unproven at this point…..’ This was put forth by Stanley Prusiner (Prusiner 2012), who won a Nobel prize for his prion discoveries. But see Lahiri 2012 for a cautionary note. ‘……..a failure in homeostatic immune regulatory mechanisms, which might itself be induced by toxic environmental exposures…’ See a paper of Vancheri et al. 2000. Note that while this study invokes induced failure of regulatory networks, it is most relevant to pathologies with persistent noxious stimuli producing fibrotic responses. ‘……[prion diseases] only appearing at a rate of about 3 per million population….’ See Safar 2012. ‘Sporadic Creutzfeldt-Jakob disease is manifested in distinct subtypes…..’ See Gambetti et al. 2003. ‘…….a variety of ways can be proposed by which the pathogenic conformational switching could be sporadically triggered….’ See Moreno-Gonzalez & Soto 2011; Safar 2012; Watts et al. 2006. ‘……the possibility has been raised ……. that xenobiotics might at least in some circumstances have a role in subverting prion chaperone assistance….’ See Reiss et al. 2000. ‘….prion misfolds per se may be quite frequent, but usually kept under control by immediate chaperone binding….’ See Kovacs & Budka 2008. ‘…..immune surveillance mediated by the adaptive immune system towards the formation of cancer cells.‘ See Dunn et al. 2004 (no relation) for a discussion of immunosurveillance and related areas. ‘…..the degenerative ‘Kuru’ form of Creutzfeldt-Jakob disease…..’ See Gajdusek 2008. ‘…..non-prion templates have been referred to as ‘heteronucleants’..’ See Gajdusek 2008. ‘……it was reported that a hamster-adapted pathogenic prion could survive such high temperatures (600˚ C) that some form of inorganic templating agent must exist…’ See Brown et al. 2000. ‘…..DNA strands can induce the formation of amyloids….’ See Giraldo 2007; Fernández-Tresguerres et al. 2010. ‘……mutations which predispose towards the formation of amyloid structures tend to destabilize a target protein’s normal conformation…..’ See Hammarström et al. 2002. ‘……the known facility of certain ‘chemical chaperones’ for stabilizing or promoting the formation of the correct conformation…..’ For a review of ‘chemical chaperones’, see Leandro & Gomes 2008. Note also that chemical chaperoning was referred to in passing in the post of 29th March of this year, with respect to the rescue of a human defective alcohol-processing enzyme by such means (this was described in a paper by Perez-Miller et al. 2010). ‘……epidemiological studies of Creutzfeldt-Jakob disease have found case clusters at greater rates than can be attributed to chance, attributed to a common environmental factor….’ See Linsell et al. 2004. ‘…..a great deal of research has focused on finding low molecular compounds which can reverse pathological protein misfolding….’ For a review of this very large field, see De Lorenzi et al. 2004.